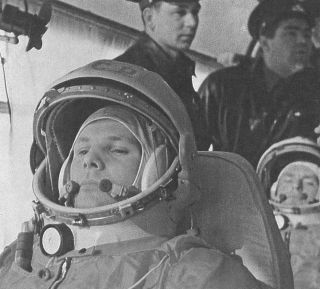 Russian pilot Yuri Gagarin became the first human to fly in space on April 12, 1961. Yuri's Night — an annual celebration of the anniversary of the first human who made it to space — will launch 160 worldwide events on April 12 in what organizers say is a special time for human spaceflight. The event is a celebration of Russian cosmonaut Yuri Gagarin and his historic first flight on April 12, 1961. Yuri's Night was founded in 2000 to help the public understand the importance of human spaceflight. The year 2019 will be "an amazing year" for spaceflight worldwide, Yuri's Night organizers said in a press release. "SpaceX plans to launch a crew on their Dragon capsule this year, and Blue Origin hopes to have their first suborbital crewed launch," the organizers wrote. "Even the steady hands at the world's space agencies are showing that they can improve on the [regular] process of delivering crew and supplies to the International Space Station, delivering the latest Russian Progress craft from the ground to the station in a mere 3 hours and 23 minutes (2 orbits) — a new record," they wrote. "The launch of a satellite like Sputnik or Explorer 1, that took the work of thousands of engineers across a nation in the 1950s, can now be accomplished by a startup in a garage that can hitch a ride on a rocket with a larger payload," the statement continues. Events are taking place in myriad countries, including Tanzania, Germany and Russia (where the anniversary is often referred to as "Cosmonautics Day"). Even the Amundsen-Scott South Pole Station in Antarctica will have its own event for visiting scientists, organizers reported. Some of the more prominent U.S. events will feature retired NASA astronaut Story Musgrave and science communicator Bill Nye (in Los Angeles), and private astronaut Richard Garriott (in Cocoa Beach, Florida, near the Kennedy Space Center). There will be an event at the Smithsonian Air and Space Museum in Washington, D.C., and two events near previously-flown space shuttles. Additionally, several celebrations will be held in conjunction with 50th anniversary of the first moon landing mission, Apollo 11, which took place in 1969. Find your local Yuri's Night at http://yurisnight.net.